Early this year the Vortex Diamondback range was subject to an upgrade: a new magnesium chassis, smaller (top-hinge) housing, plus dielectric mirror coatings to increase light transmission. Improvements must come at a cost, but the modest price increase seems easily justified. With plenty of competition in the circa £200 price range, we take a thorough look at the Diamondback 32mm and 42mm models to see how they perform. 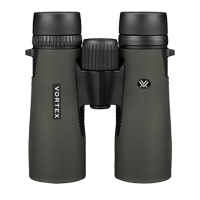 As is the standard for binoculars in this price region, the new Vortex Diamondback utilise BAK4 prisms with fully multi-coated glass, which all-in-all ensures as much light as possible can pass through the binoculars. No improvements here, but as previously mentioned, these latest models have been upgraded to include dielectric mirror coatings. Mirrors on roof prism binoculars require some form of coating to increase light reflectivity, and dielectric mirror coatings can reflect more than 99% of light. 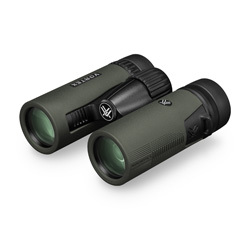 Compare that to 95-98% for silver coatings, which are far more commonplace amongst similarly priced binoculars, the Diamondback's low light performance is superior to many. Late afternoon in November provided a stern test, as the dusk deepened, I was still able to discern details on our regular Robin outside the shop. The Diamondback range don't benefit from ED (Extra-low Dispersion) glass, which is designed to reduce/eliminate CA (Chromatic Aberration), but in every day use I found little evidence of colour fringing. In certain light conditions, CA was evident (particularly at the edges) but still not too distracting, though the 10x magnification models seemed to suffer more than the 8x. The 8x32 and 8x42 boast a very wide field of view, 8°, and the 10x32 and 10x42 have 6.5° and 6.6° respectively. Having such a wide picture was very enjoyable in use and with little softening at the edges, the Diamondbacks scored well here. All models produce a very good level of detail from the centre to near the periphery of the view, allowing me to fully appreciate a pair of arguing Wrens nearby. Colour is reproduced well, not necessarily better than the competition, until you look towards the sunlight, when the Diamondbacks handle glare very well to retain an impressive level of colour and contrast. Close focus is quoted between 1.5m and 2m depending on the model (view our product pages for full specifications), although I couldn't focus quite as close as stated with any model. Build quality seems very good, the new magnesium chassis an improvement over the old polycarbonate model. Vortex use Argon gas rather than nitrogen when replacing the air inside the optics, this prevents any internal fogging and is considered slightly better than nitrogen. Being O-ring sealed too provides complete waterproofing, which when coupled with the dark green rubber armouring, offers protection against all weathers. The loops for the lanyard are moulded from the magnesium body but the area around it, as well as the bridge, aren't covered in rubber so may be prone to picking up scratches, though not something I was willing to test for the purpose of this review! 3 stage twist up eye-cups on all models rotate smoothly, lock in place with plenty of assurance and should provide adequate eye relief for spectacle wearers, though it's worth noting the 8x32 (12mm) & 10x32 (10mm) don't provide as much relief as the 8x42 (18mm) or 10x42 (16mm). The dioptre adjustment isn't lockable but similarly to the eye-cups, stays in position positively when set and is unlikely to be accidentally moved. There's around 1 ¾ turns from close focus to infinity, the wheel a bit stiff out of the box but beautifully smooth after a bit of use. Both 32mm models weigh a fraction under 440g and the 42mm models around the 600g mark. These figures are very low, a real plus for those looking to minimize weight. To put it in to perspective, the average for 32mm binoculars is around 500g and 42mm bins are normally nearer 700g. This adds a certain level of comfort in itself, making one handed use fairly easy. The thumb recesses on all models are positioned well, set in to the underside of the textured rubber armour which provides ample grip, and the new top hinge design allows a more comfortable hold, in turn reducing shake during use. The Diamondback 32 and 42 models come with a moulded hard carry case, comfortable padded lanyard, rainguard, Vortex branded stay-on lens caps, user manual and cleaning cloth. This style of case is my preference, as though others prefer a soft alternative, I feel the clamshell case provides more protection during travel or transit. Of course, we all like to look after our binoculars, but Vortex are always there to back you up should they become unusable. Apart from cover against loss, theft or damage on purpose, the warranty provides you with complete protection, even against accidental damage, forever. The Vortex VIP Warranty is only available when purchased through authorised dealers, so watch out in the UK for too-good-to-be-true prices on popular auction websites or marketplaces. The new 2016 Diamondback range received some innovative updates to the predecessor, giving the binocular a very fresh look and feel. The fractionally smaller dimensions and appreciably lighter weight are a real benefit, with many birdwatchers now toting a camera in their gear, any saving is well received. 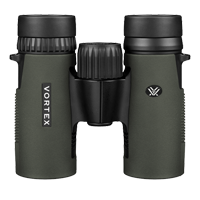 As other rival binoculars introduce ED glass to this price range, Vortex chose to go down a different route with dielectric mirror coatings, so although they may stuggle at times with colour fringing, their greater ability to perform in low light is an advantage to some. The 8x32 or 10x32 are as good optically as any sub £200 binocular I have tried, with the real bonus being they'll fit in a coat pocket. 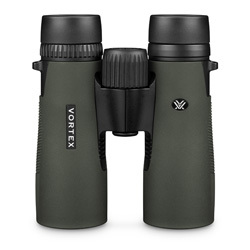 The wide field of view and large exit pupil of the 8x42 means ultimately this would be the best 'all-round' binocular, but each model features its own benefits, so it's worth thinking hard about what you need from your binoculars, though you can't go wrong with a Vortex Diamondback.